The Aquarius vessel operated by a Franco-German aid group has arranged to dock in Malta. The 141 rescued migrants on board will be distributed among five EU member states, with support from the European Commission. A group of EU member states agreed on Tuesday to a so-called responsibility sharing exercise "with the support of the European Commission" regarding 141 migrants rescued last week. Malta will allow the Aquarius — run by SOS Mediterranee and Doctors without Borders (MSF) who picked up the migrants — to enter its ports, "despite having no legal obligation to do so," according to a statement by the Maltese government. The people on board will be distributed amongst France, Germany, Luxembourg, Portugal and Spain, the statement added. It was not initially specified what support the European Commission would provide. Germany will take in as many as 50 of the migrants. Interior Minister Horst Seehofer had "agreed for humanitarian reasons to support Malta on the condition that other countries also help," the interior ministry said. "Dealing with migrants rescued from distress in the future requires an imminent European solution and the solidarity of all member states." Spain will take in 60 migrants as part of the agreement. "Spain has coordinated a pioneering agreement with five countries to distribute the reception of the people of the Aquarius... Spain will receive 60 people," Prime Minister Pedro Sanchez wrote on Twitter. The Italian government has refused to allow rescue ships to dock at its ports, calling for all migrants rescued at sea to be taken to Libya or other EU ports. The EU's migration commissioner, Dimitris Avramopoulos, said the bloc needed to find a long-term solution to the migrant issue. "I commend France Spain Germany Portugal and Luxembourg for their solidarity to take a share of the migrants on board. We need sustainable solutions. This is the responsibility of the EU as a whole," he said on Twitter. 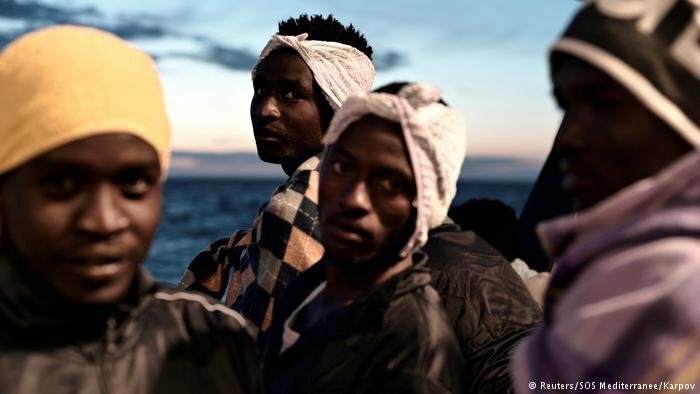 Of the rescued people, 25 are thought to have spent 35 hours adrift at sea. The other 116 migrants, 67 of whom are unaccompanied minors, were picked up in a separate operation. The migrants were picked up in two separate operations on Friday. The people rescued told the crew that several ships passed them by without offering assistance, according to SOS Mediterranee.